For the 10th year in a row, we were honored to be a part of the Dayspring Center Annual Mini-Golf Classic, and what a night it was! For those who are unfamiliar, Dayspring provides emergency shelter, clothing, and three nourishing meals a day for homeless families with children here in central Indiana. They work day in and day out to combat and prevent family homelessness by first, meeting their most immediate needs for food and shelter, then working with each family to address the issues that led them to their homelessness, and are amazingly effective in what they do. Eighty percent (80%) of residents who complete the program at Dayspring Center move directly into permanent housing. We love Dayspring and, in an effort to support them and their mission here in the local community, have sponsored a hole at their annual fundraiser for several years. The event is a complete blast and is much more than just putt-putt. Think costumes, a lively crowd, a DJ, a silent auction, and surprisingly fierce competition for the coveted trophy, all backlit by a beautiful summer sunset. 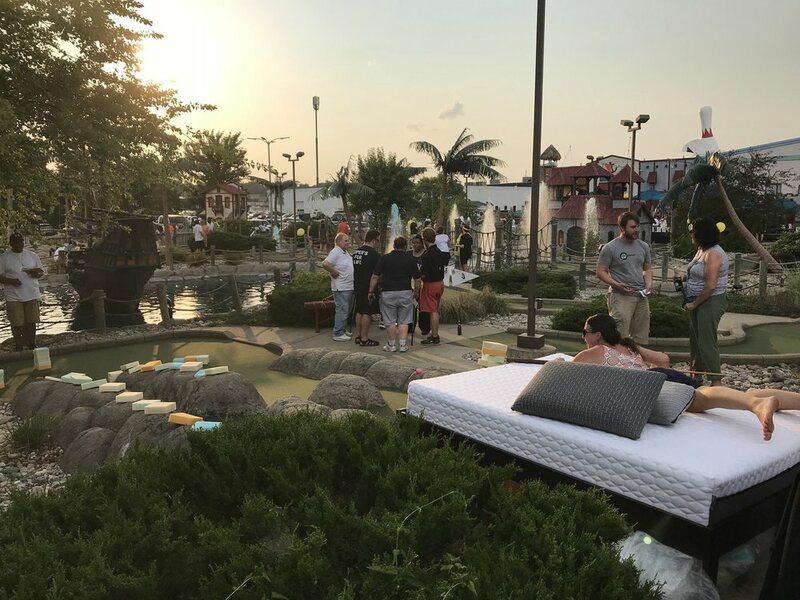 On our hole, participants had to lay on one of our locally-made, customized mattresses and "putt" their ball off of the bed with pool cue. We committed to donating one mattress to Dayspring Center for every hole-in-one made on our hole, and by the end of the night, five separate people managed to make it happen! That is five new, comfortable mattresses for the families at Dayspring, and we couldn't be more thrilled. Thanks to Dayspring and the lively and generous participants for the wonderful night of fun! We're already practicing our putting for next year, and you'd better believe we're coming for that trophy.